€870 per person including 1 night at Berber Camp. The Anti-Atlas extends from the Atlantic Ocean in the southwest of Morocco toward the northeast to the heights of Ouarzazate and further east to the city of Tafilalt (altogether a distance of approximately 500 kilometres or 310 miles). In the south it borders the Sahara. 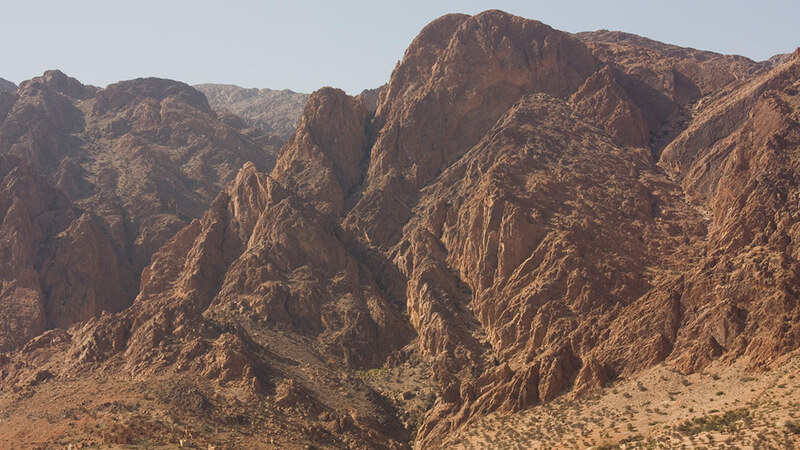 It includes the Djebel Siroua, a massif of volcanic origin with the highest summit of the range at 3,304 m.
A longer version of our 5 days circuit to the hidden places of the Anti-Atlas, this itinerary also incorporates the Ounila Valley, Dades Gorge and Jebel Sahro. 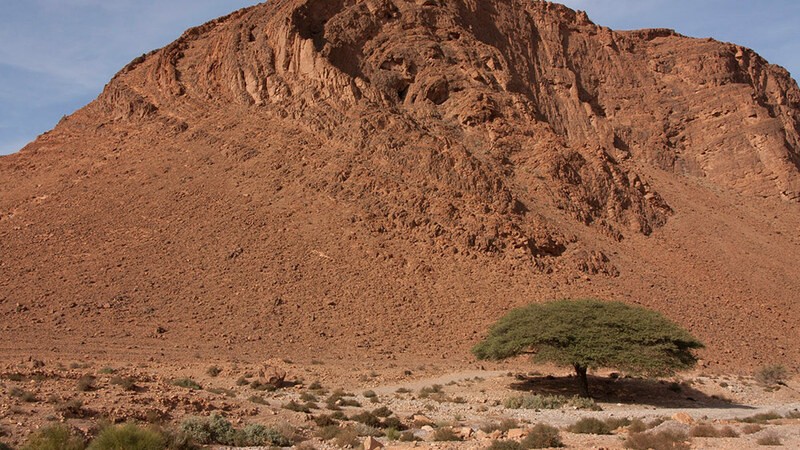 Further highlights will include the Ameln Valley, the Ait Mansour Gorges, the Sahara desert and the Draa Valley. You can expect some longer driving days and covering a much greater tract of the South with a final night spent at the Coast. Leave Marrakech after early breakfast and drive to the Dades Valley. Traverse the High Atlas mountains via the highest main road pass in Morocco, at 2260m altitude, offering stunning views and exhilarating driving. The route passes lush valleys and traditional adobe Berber villages by the road-side. North-east of Ouarzazate start to follow the Dades River, which charts the self-titled “route of a thousand kasbahs”. North of Boumalne Dades, the Dades River winds its way through a lush valley, dotted with ruined kasbahs on vantage points and surrounded by the most unusual rock formations and cliffs. The valley becomes ever narrower until the river carves through the spectacular gap of the Dades Gorge. Overnight in a traditional guest-house in the Valley. After breakfast, set off the journey by passing once more via Boumalne Dades. Then the route southwards gradually becomes ‘piste’, leaving the tarmac road behind, to traverse the Anti-Atlas Jebel Sahro massif, at approx. 2200m altitude, via the Tazazert Pass. The volcanic Sahro region is characterised by other-worldly reliefs, peaks and canyons. Losing height, the piste descends on to the broad dry river plain to join the town of Nkob, with its palm oasis and myriad of well-preserved kasbahs. Leaving Nkob, the journey continues onwards initially south-west, then south-east, to leave the Jebel Sahro behind and to join the lush Draa River Valley. The Draa is the longest river in Morocco, flanked by glorious palm oases, series of ancient kasbahs, and the mountain ridges of the Anti-Atlas. 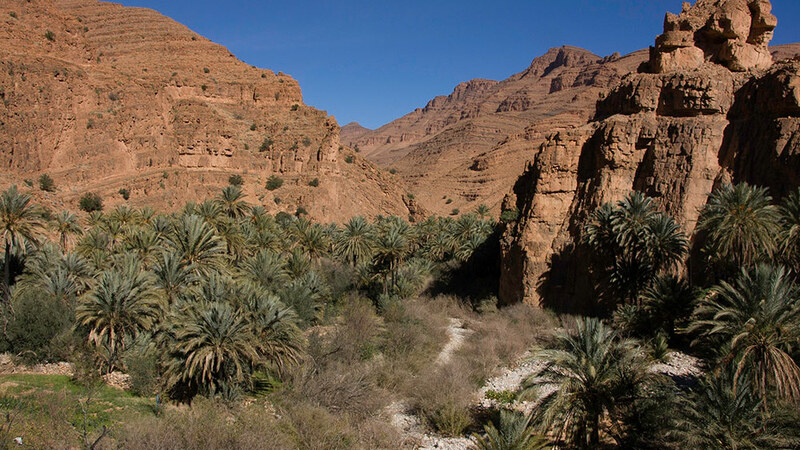 The route passes along the Draa Valley to where you’ll overnight at Zagora palm grove. Today’s route passes along the Draa Valley on to Tamegroute, where (depending on the weekday) it may be possible to visit the ancient library (17th Century) and pottery cooperative, then Tagounite and Mhamid. The tarmac road ends at the village of Mhamid, frontier to the Sahara Desert, and we then drive across the desert terrain for 2 hours to reach camp at the remote great dunes of Erg Chigaga (Morocco’s longest sand sea). 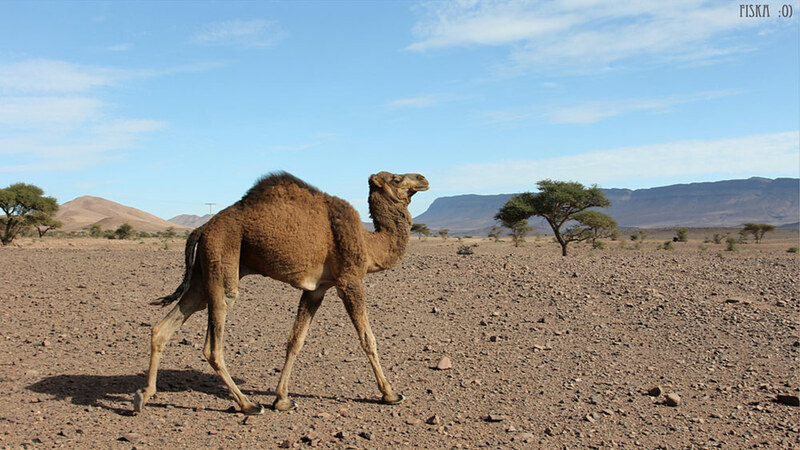 Expect to arrive at the desert camp early afternoon, take a camel-ride out from camp and then walk out on to the rolling dunes to admire the sunset. Enjoy traditional music next to the campfire after dinner. Overnight at the desert camp, sleeping in rustic Berber tents. Wake early to watch the desert sunrise and then take breakfast. After breakfast, leave the camp and drive out of the desert in the opposite direction to how you arrived. Drive off-road across the desert for 3 hours (north-west) to the town of Foum Zguid, via arguably some of the finest remote scenery in Morocco (including the vast dried salt flats, at Lake Iriqui, and the imposing mountain ridges of the Jebel Bani, the Anti-Atlas range). From Foum Zguid, drive westwards via the outer reaches of the Anti-Atlas mountains (the Jebel Bani) via dramatic and arid scenery, interrupted by palm oases and small settlements. During the afternoon reach the Tafraoute region and you will overnight in the scenic Ameln Valley, at the base of ochre-coloured mountains. This morning visit the Ait Mansour Gorges, one of the highlights of the area. The canyons make for an interesting short walk, with outlying small villages, palm trees, and colourful rock faces. From there, drive northwards to leave the Anti-Atlas mountains behind, and to descend to the plain of the Souss river. Driving northwards via some single-track roads, some of which are unsurfaced, you’ll pass through typical mountain settlements. Descending to the fertile Souss Valley, reach the medieval walled town of Taroudant and spend the night outside the walled medina at a comfortable guest house. Leaving Taroudant, drive north along the Atlantic coast road to Essaouira today. From Taroudant you’ll pass through the outskirts of Agadir to reach the coastline. The road initially follows the surf beaches and cliff-tops before gaining height on a winding course into hilly country. This is where you’ll meet the Argan tree Biosphere and the landscape appears very different (clusters of white-stone dwellings amidst the trees and rolling fields). Continuing north reach Essaouira and overnight at a riad inside the white-washed medina. Drive back to Marrakech, either before or after lunch.